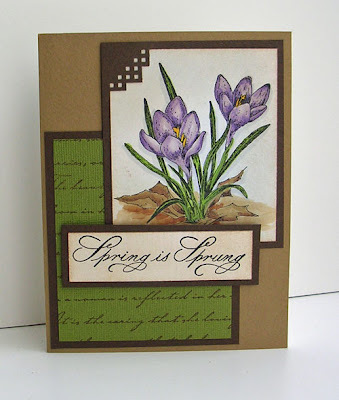 This was my entry for the card sketch over at Splitcoast Stampers this week. I LOVE this image - and I'm so ready for spring! I managed to goof it up a bit ...sigh.... The 4th layer was supposed to be something cut out but I just popped it up instead. Still - I think it looks OK and it is very close to the sketch. I've have been having fun with my Copic markers. I'm trying to decide if I should do a couple posts on using them. There is a lot of good information already out there and I am still learning about them. But I do have some info to share - mostly about what not to do - so you can avoid mistakes I've made! Ranger Distress ink in Vintage photo, Brilliance Graphite Black. Cardstock is Prism and Bazzill. I love this card, and would love for you to do a post about Copics. You know that I think your word is gospel on that topic! Great job on this sketch. The card is beautiful! I'm with you on wishing for spring! I LOVE this card....just gorgeous! Love, love, love it! As for the copic info....hop to it I say! One can never have too much info....I love hearing what everyone has to say on the topic....and everyone does it a little differently.